I’ve been thinking about the power of words, spoken and written. Spoken words can uplift and tear down, they can burrow deeply inside to flourish or fester. I’m so thankful for parents who encouraged me to be me — even when the world disagreed. Daddy gave me song, laughter, and a wild imagination. Mother gave me music in written word — which evoked colors and smells and images and emotions that stretched and shaped me. Every time I smell the cheerful brightness of a freshly peeled orange, I picture myself as a 3rd grader sick in bed with something horrible. Mother brought me orange slices, sat by my bed, and read the adventures of Hitty and the girls who loved her for a hundred years. I have some of the books from my childhood, though not my original Hitty. I picked up this adapted and updated version at a SCBWI conference a few years back. 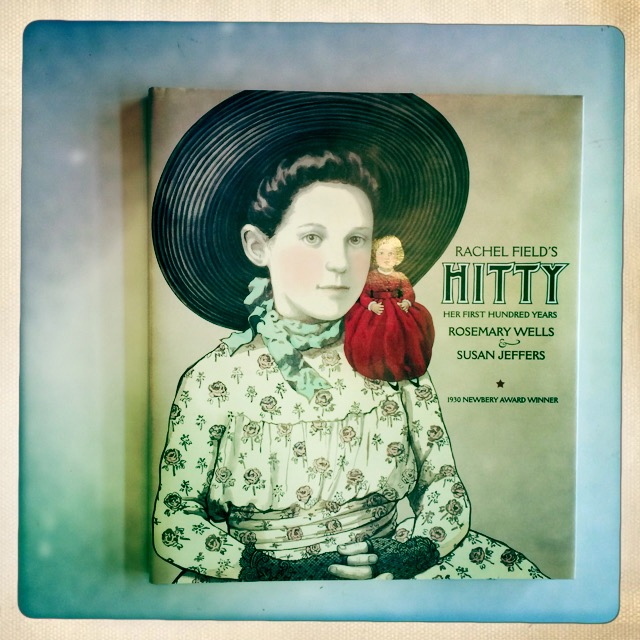 After attending the SCBWI winter conference, I dug up some of the books that influenced my childhood. I have a few to share with you. 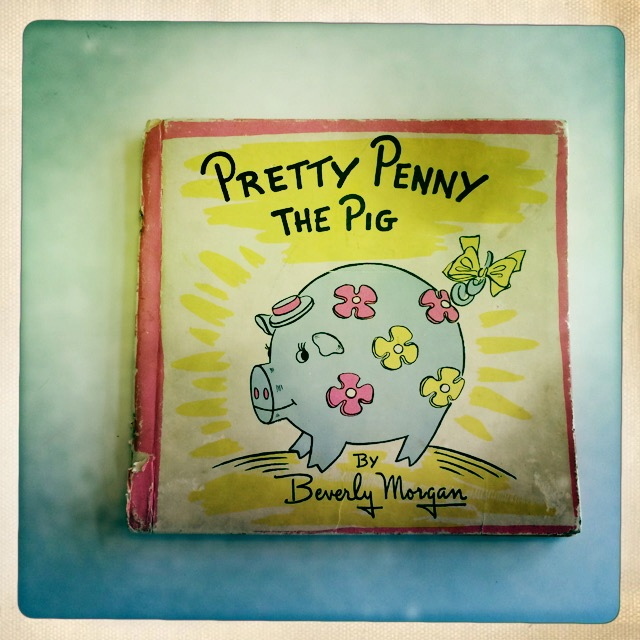 Pretty Penny — I loved this book for it’s vibrant colors. I have a guest bedroom this color. 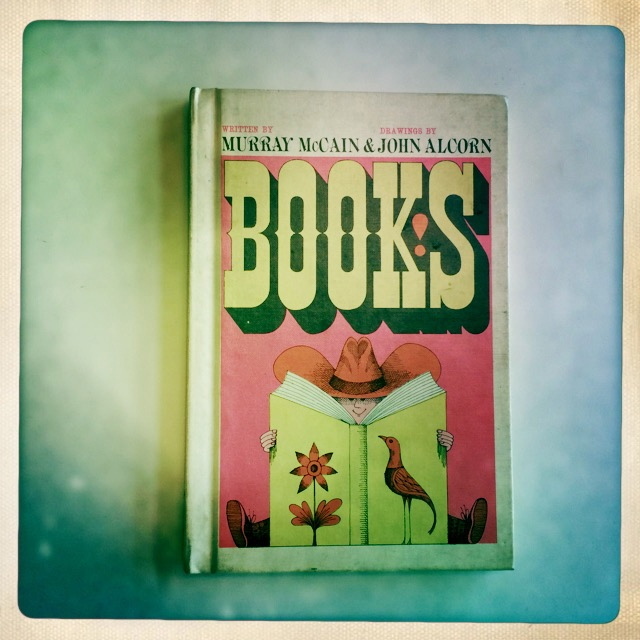 Funny to trace the roots of my love for color back to books from childhood. Here’s a book called Books. The illustrations are wacky and colorful — opening the possibilities of what words can create. 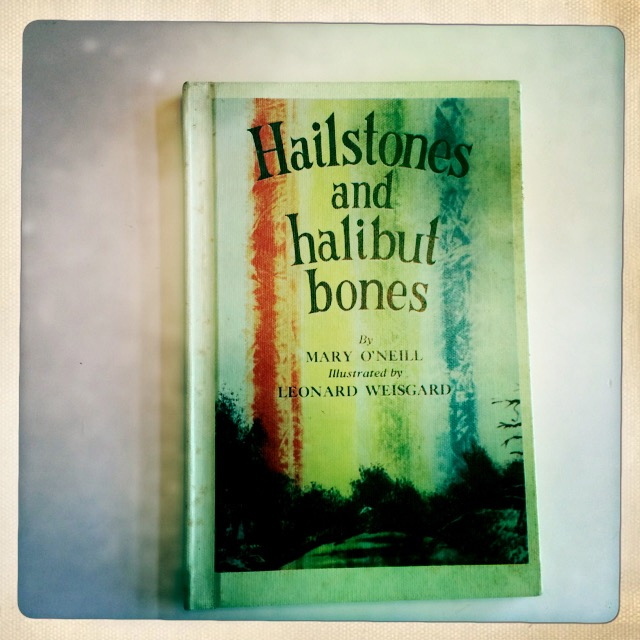 Hailstones and Halibut Bones is a book in rhyme inspired by color. Each page has a color theme. Each room in my house is painted a different color: my living room is yellow, my office is lime green, my bedroom is blue, the guest room is pink, my bathroom is green/yellow/pink/blue to match the Mackensie-Childs sink and tiles. 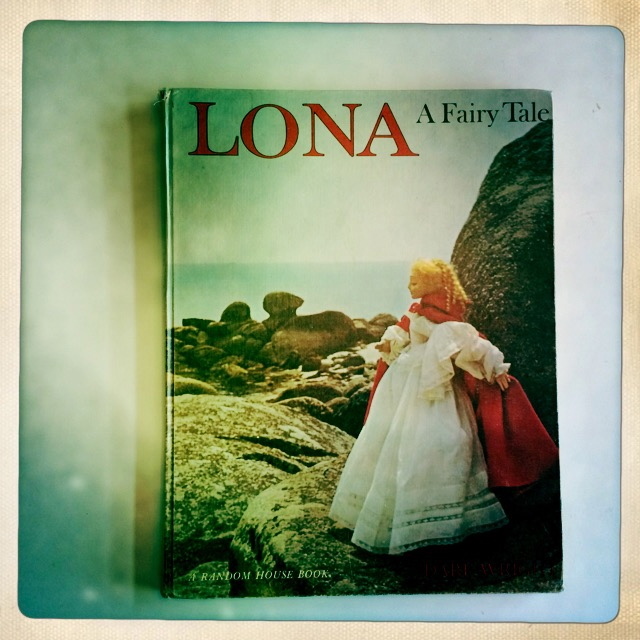 Lona is one of my favorite books from Mother. I still love Lona. I trace back my fascination with pinhole photography to this book by photographer Dare Wright. I still have the original with my sister’s drawings on the pages. We’re twelve years apart. She and I fought over this book a few years back. I won. 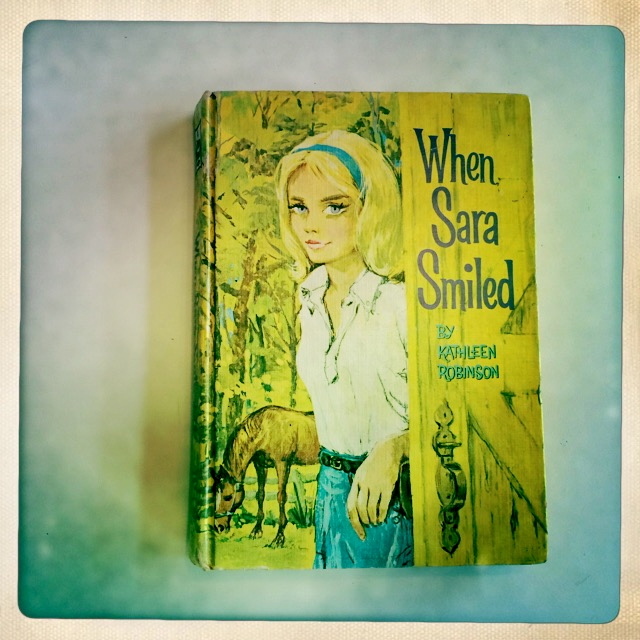 When Sara Smiled is about a girl with violet eyes who is too shy to talk to boys, but feels totally comfortable talking to horses. She spoke to me when I was younger. I SO wanted her violet eyes to go with my blond hair. I also wanted the horse and the boy in the book…. I don’t know how many times I read this book and dreamed of violet-eyed romance. What’s missing in my collection? Little Women! I’m pretty sure I still have my original…tucked away somewhere. I just can’t put my hands on it. Beth dies [spoiler alert] which I hated, since we share the same name. But Jo was my hero. I composed my own newspapers and stories, like Jo. Also, Wuthering Heights. My Senior year in high school, I loved it. Re-reading it now, I’m horrified by the dysfunction. But at that time in my life, I was reeling from the loss of my best friend. I think the tale of dark, obsessive love appealed to what was broken in me. The Bible, my lifetime favorite book, healed the brokenness, so I’m back to the my happy world of butterflies, flowers, and rainbows. Thank you Mother for sharing the written word with me. You always made me feel special. You awoke stories and colors in me. Or perhaps they were already there, and you helped me find them. What books influenced you growing up? Do you have them still? My blogposts are few and far between over the last few years. Ah, the life of a PhD candidate. Work and school have kept me hopping. Now that I’m on the final leg of the PhD marathon, the stories in my head are getting louder. After completing a crazy December with my qualifying exam, prelim exam, and oral defense, I decided to treat myself with the New York Children’s Book Writers and Illustrators Winter Conference. It’s been awhile. My last SCBWI conference was Bologna 2010. 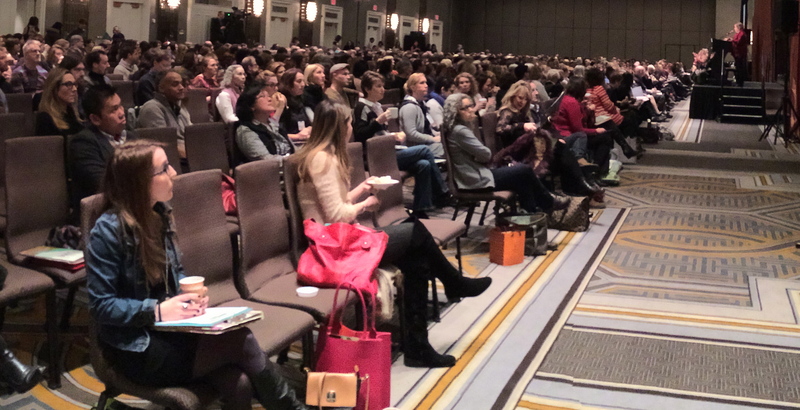 The 16th annual Children’s Book Writers and Illustrators Conference brought together over 1000 writers and illustrators from around the world. I attended the World Building workshop on Friday. Author Henry Neff shared his world building techniques, then applied what we learned to our own stories. We spent much of the morning and afternoon in small critiques sessions of seven or eight writers per table. Literary agent Brooks Sherman of the Bent Agency headed up our critique table. We took turns sharing stories about cheating game board characters and talking pencils, Romeo and Juliet with a sea-witch twist, Afghani book guardians of the mouse-kind, and girl vs. the volcano in a National Park. Thanks Brooks for being so gracious and thoughtful in your critique. I truly enjoyed learning from others as we refined our plots and characters together. Side note: I happened to sit next to a fellow bureaucrat who works for the State Department and knows one of my NASA colleagues. What are the odds in a conference with over 1000 attendees? We kicked off the afternoon with a dialogue between James Dashner, author of Maze Runner, and his editor Krista Marino, Executive Editor of Delacorte Press. 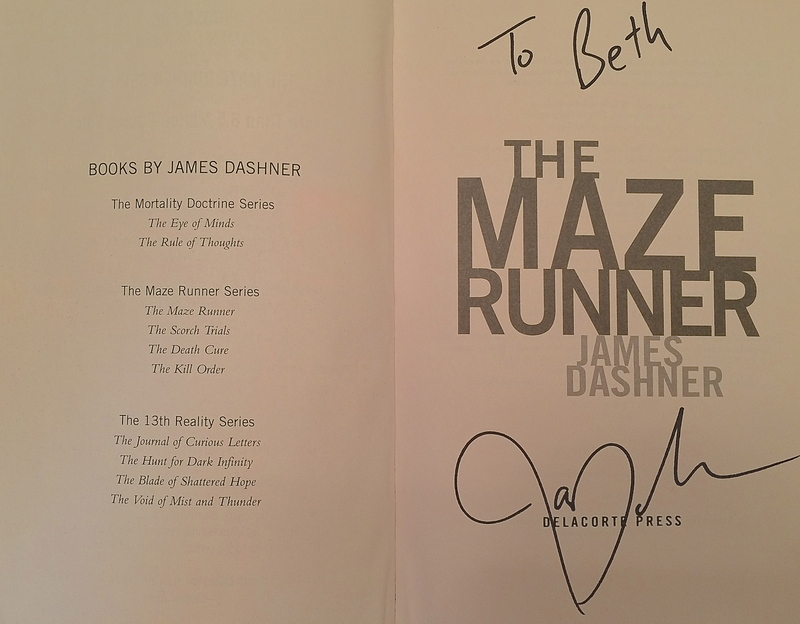 They described the Maze Runner journey from manuscript to book to movie, as well as the process to develop his newest series, the Mortality Doctrine. They have a collaborative co-creation process, which is born of a deeply trusting relationship. Quite inspiring. We wrapped up Friday with an Editor and Agent Panel: “The Past, Present, and Future of Fantasy and Science Fiction in Children’s Books” with Toni Markiet, Senior Executive Editor, HarperCollins Children’s Books; Brooks Sherman of Bent; Ari Lewin, Executive Editor, G.P. Putnam’s Sons/Penguin Young Readers Group; and Krista Marino, James Dashner’s editor. The full conference kicked off on Saturday with keynote speaker Anthony Horowitz, author of the best selling teen spy series, Alex Rider, the writer and creator of BBC’s Foyle’s War and Midsomer Murders. The character of Sam in Foyle’s War is fashioned after his nanny who told him stories of the war growing up. I SO love Sam! 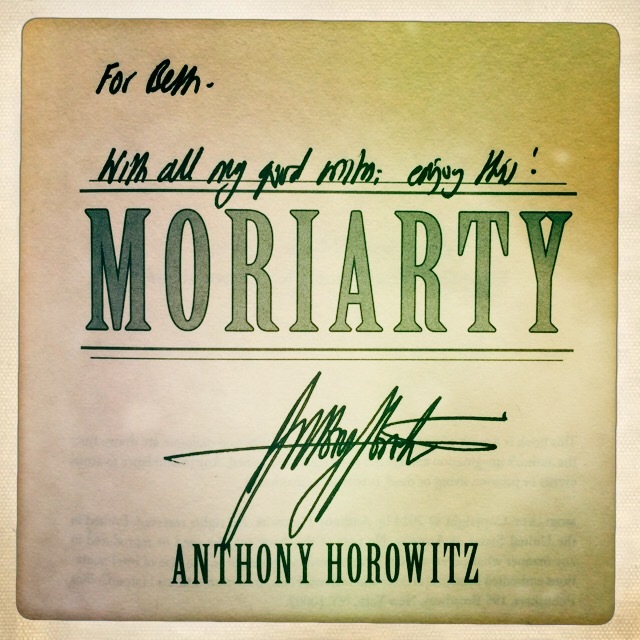 He was commissioned by the Conan Doyle estate to write new Sherlock Holmes novels: House of Silk and Moriarty (which he autographed for me — image below). He’s in the process of writing a new official James Bond novel. Super cool. I attended a workshop with Aimee Friedman, Executive Editor at Scholastic and author of middle grade and young adult fiction. She talked about her journey from editor to author, and shared her passion for books. 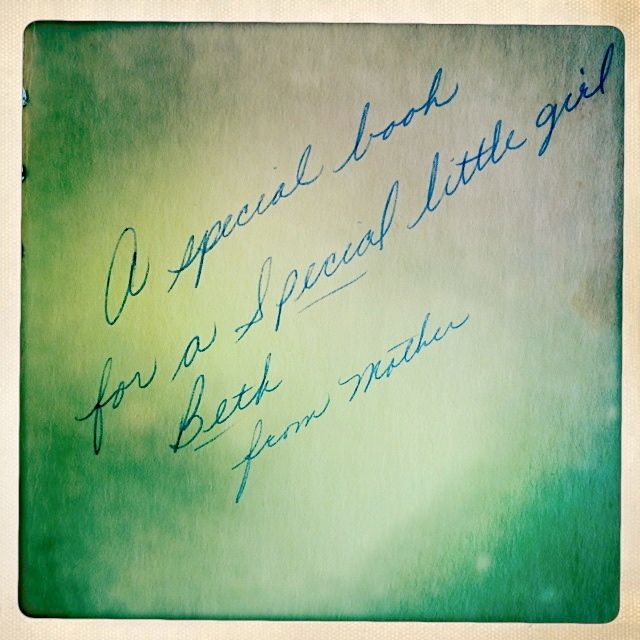 She wrote her first book at age five and consumed all the Baby-Sitter’s Club books by Ann M. Martin. I was more into mystery as a kid. Nancy Drew and the Hardy Boys. Actually, my daughters and I STILL read Nancy Drew…out loud…usually in the back yard patio…with a glass or two of wine. We take turns reading the chapters — adding our own dialogue and dialects as we go. Silly, yes, but oh so much fun. 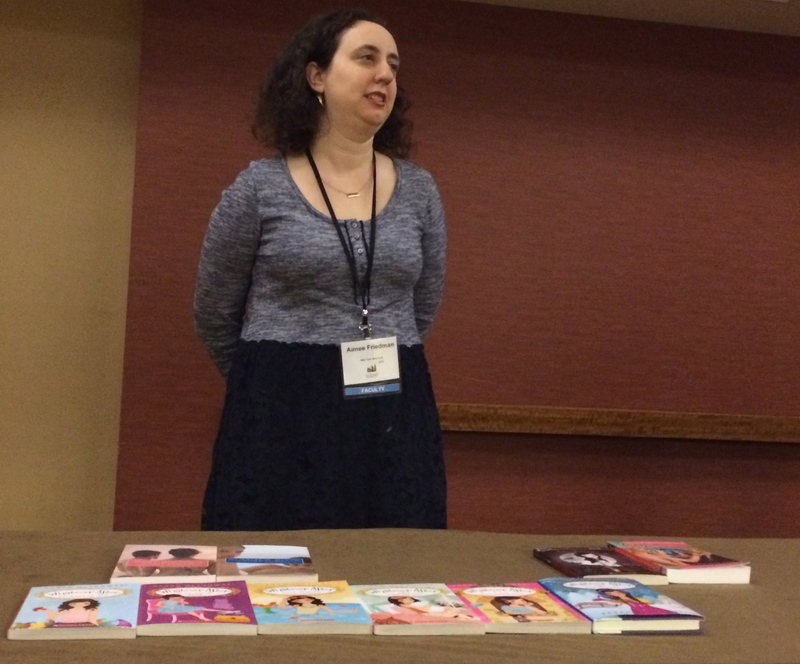 SCBWI 2015 NYC Winter Conference: Aimee Friedman, Executive Editor, Scholastic Inc.
Margaret Raymo, Senior Executive Editor of Houghton Mifflin Harcourt Books for Young Readers, led a workshop on how to work with an editor. She stressed the importance of good writing and good characters. A weak plot is fixable. Poor writing, not so much. The best part of the conference is meeting awesome writers and hearing their imaginative stories. Each of us brings fresh perspectives to the topics we care about. We build relationships over our common passion — writing. I ran into a writer buddy from the Bologna 2010 conference today as I stood in line for autographs: Angela Cerrito. She has another book coming out in September. Congrats Angela!! On the drive home from New York, new stories and characters invaded my head. I documented their presence, but they’ll have to wait a little longer to come to life. Right now, I have a louder voice in my head — the one telling me to get cracking on my dissertation! With spotty wireless access at our Bologna hotel — four WiFi providers in four days — blogging became a contact sport. Now that I’m back home, I can share a few snippets about the personal connections I made in Bologna without fear of losing internet connection. My sister Aimee, of Aimee Louise Photography, flew up from Dallas, Texas to travel with me to Bologna. She offered her services to the SCBWI Bologna organizers for the conference. They graciously accepted. YAY! How fun for us to attend together! While Aimee documented events at the symposium and Bologna Children’s Book Fair, I attended the writers’ sessions and manuscript critiques. Aimee shared a few of her pics with me — like this one of Illustrator John Shelley’s tie. Her blog has more pics. John, one of the organizers of the SCBWI Bologna 2010 event, wowed us with his wardrobe choices and colors. Red seems to be a theme for him. I’m not sure yet what it reveals about him, but he’s hard to miss in a crowd. Delightful. Unique. Engaging. The tie says it all! I enjoyed chatting with Leonard Marcus, Children’s book historian, author and critic. Aimee used his book reviews in Parenting magazine to pick books for her boys. Leonard is interested in putting together an art exhibition of childrens’ books on space. What a great idea. We have a NASA Art Program. Might be a good fit. What a privilege to speak with Gita Wolf of Tara Books in India. They search for local artisans to translate their art into book form. “Do!” — text by Gita and illustrations by Ramesh Hengadi and Shantaram DhadpeGita — won a BolognaRagazzi Award in the New Horizons category. I love how a magnificent book like this can bring rich traditions of India to children around the world. Funny story about Neal Porter of Roaring Brook Press. We could only get wireless down in the lobby at our hotel — when we could get it to work. Aimee was processing her conference images, selecting the top dozen to submit to the SCBWI organizers, but couldn’t get her internet access to work. She put the images on a thumb drive for me to email her selections. I was waiting for the images to upload into email. Took forEVER. While I waited impatiently, Neal Porter walked into the lobby with colleagues. His image stared at me from my computer screen while he settled on a couch nearby. So bazaar. I walked over and showed him Aimee’s picture. He loved it and asked us to email it to him. I did. Of all the hotel lobbies in all the city…. I met new friends and reconnected with writers I’d met in Bologna two years ago. The amazing Candy Gourlay typed furiously in front of me during the conference, trying to capture notes from our presenters. Her blog, Notes from the Slush Pile, is delightful. I was blown away by Candy’s writing in during the 2008 symposium — lyrical, musical language. She’s a gifted writer. Her post about Richard Peck captures his “call to action” for us as writers. Sarah Towle , founder and creator of Time Traveler Tours, gave us great advice on best places to eat near our hotel. She’s writing a wonderful historical novel about the French revolution. Based on the excerpt she read to us during one of the sessions, I can’t wait for a publisher to snap up her manuscript. I met a kindred spirit: Sandra Nickel from Switzerland. She’s writing a story about a haunted French chalet. Sounds intriguing. She signed with an agent in the last few weeks, so things should get moving for her. She’s so much fun. I wish we lived closer! Marjorie Van Heerden is a children’s book writer and illustrator from South Africa. My daughter is moving down to South Africa in July to work with Bethany House Trust as a counselor, so I was thrilled to spend time with Marjorie and soak up her stories about my daughter’s new home. Marjorie illustrated over 100 children’s books which have been published in 33 languages. In her spare time, she serves as the co-regional advisor of the new South African chapter of SCBWI. She invited us to visit her in Cape Town. We just may take her up on her offer. I met Doug Cushman, author/illustrator of over 100 books, during lunch at the conference, then kept running into him at the Bologna Book Fair, the shops in Bologna, and on our flight from Bologna to Paris (his home base). He’s warm and unassuming — though he thought we were stalking him. 😉 Nice, nice guy. Bonus points for a guy who writes about a Space Cat! The manuscript critiques, as much as I hate them, really gave me great insights into how to make the stories better. Ellen Hopkins, author of multiple New York Times bestsellers in teen fiction, as well as numerous non-fiction books, critiqued “Purrgus, A Cat of Olden Times.” She suggested the story should be about a boy, rather than a cat; and challenged me to consider nonfiction. So many possibilities. Thanks Ellen. Her newest in the “Crank” series, “Fallout,” comes out this fall. Literary Agent John Cusick of Scott Treimel NY critiqued “The Ultra Secret Lives of Xandri and Jam.” He liked the concept but thought little Jam should be older — 5 or 6, possibly 7. Makes sense. He offered great insight on how readers relate to characters. I look forward to my next rewrite with his comments in mind. John’s young adult novel, Girl Parts, will debut this fall. How cool is that? Purely by happenstance, I was given the opportunity to pitch “Xandri and Jam” to Ginger Clark, Literary Agent for Curtis Brown in New York. I’d actually met Ginger briefly at a 2007 writers’ conference in Texas. Ok, we didn’t actually meet. She stood beside a group of us at the reception and I offered for her to join us. Ginger doesn’t carry fond memories of the conference or Texans, for that matter; but is willing to overlook my Texan heritage. Good thing. At the Bologna airport, we befriended Erika Pedrick, Subsidiary Rights Supervisor for APA Books/Magination Press of the American Psychological Association. She stood in line in front of us at the Air France baggage counter for over an hour, only to get turned away and told to return in 30 minutes for the next flight. We became traveling buddies. What a nice surprise out of a frustrating experience. Tioka Tokedira, SCBWI Bologna Reviews coordinator. Wifi access hampers my ability to share tidbits from our SCBWI Bologna conference in a timely manner. With the expectation of instant access to information these days, a 48 hour delay from spotty service feels frustrating. Hard to imagine the days of old when written word travelled by foot, horseback or boat. Here are my hastily-typed notes from Monday’s conference. Fiona heads up the Acquisitions Department of Laika Entertainment, the Oregon- based feature animation studio. They recently produced the Academy Award-nominated animated film, Coraline. What are movie studios looking for? The Holy Grail = a story that appeals to boys and girls and is contemporary and relatable. We often option book of Genesis, but make the story of Moses. Small independent producers still make lovely films from non-brand books. Each film takes for years to make. I’m looking for options in 2020. Option deal – give film producer the right to work on story to film – one year-18 months. Sometimes authors get money up front. Sometimes not. You, the author, give the studio ALL rights to your book. Even though your book is optioned for a film, doesn’t mean a film will EVER be made. The studio investment in a film is so huge, movie studios need merchandising to make their investment profitable. Fox is the most book-friendly studio. Warner – 180 options each year, make 10% of them each year. Development process — from book to script and beyond. When reading a book, the magic of the journey is the interpretation inside your head. Film is about what people say and people do in on the screen as you watch. No one will sit in the theater long enough to have the entire book unfold. Film translates the “spirit” of the book. Screenwriters may need to add or delete character. Screenwriters shift the point of view of the book from inside to the outside view of film-makers. Writers lose control of what happens in book. Decisions by film-making crews. Best thing you can have is a great relationship with film-makers and trust the process. Book to film: 1 page = 1 minute = $1M! Sometimes we work for three years to sift for the nugget of the story to craft a good screen-play adaption. Dressidea Cowell – “How to Train your Dragon” – “superficially, the film is not like the book, but the theme is still there…!” Book optioned in 2003 for 2010 debut. Coraline’s sweaters knitted by hand with knitting needles the size of human hair! Every vowel sound has a different face – over 12000 faces! 6 seconds a week for animation! Ellen is the award-winning author of twenty children’s nonfiction books, and six New York Times bestselling young adult novels-in-verse. She also critiqued one of my manuscripts — giving me thought-provoking ideas on a change of characters…and perhaps a non-fiction book, as well. YA pushed into 14 and older. Newer grey areas in categories. New middle ground above the YA market. Tween fiction – stories with positive family interaction. Notable exception in Tween Lit – Lemony Snickett and JK Rowlings – adult characters aren’t good guys. Tween for girls – Lizzy Maguire, Hanna Montana. Tween for boys – graphic novels, Harry Potter. YA authors should write for readers aged 11 to 70, but aim at the older teen. YA readers buy their own books. Buy independently from their parents. 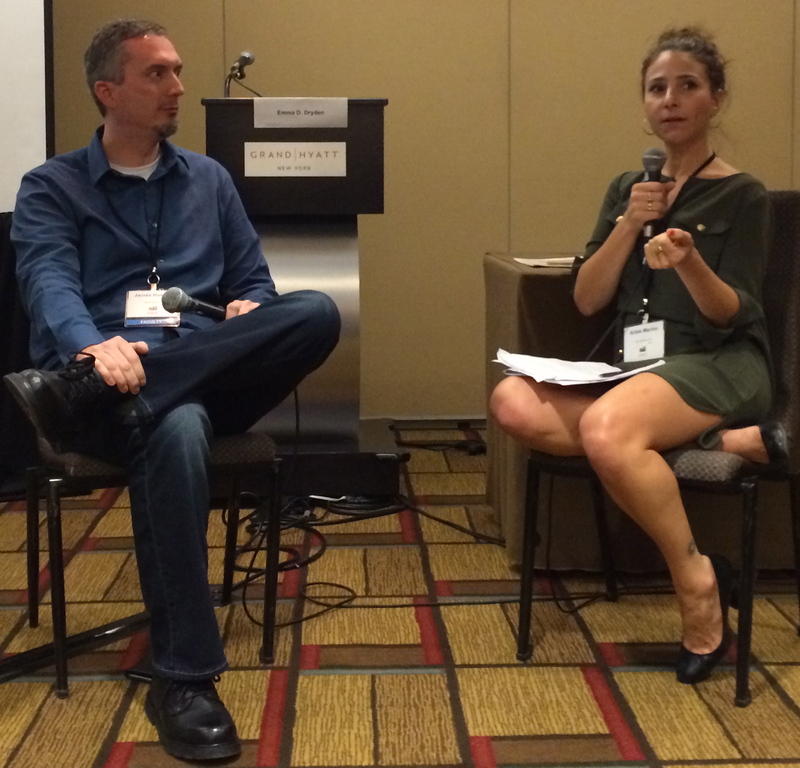 YA writers – we feel responsibility to our readers, we write better literature. It helps if you’ve never quite graduated. Where will your journey start? Don’t underestimate your readers. Has it happened to you? Your family? Kids? Someone you know? Or maybe it happened to someone you read about. Or hear about. “Tricks” about teen prostitutes – I spent a week in Vegas with Vice Squad, talking to teens on the street. Build characters: 2 month process before ever putting words on paper. Hugely important to have characters relate to readers. Characters should have flaws, Let us see them and let us know how each character feels about having flaws. Bad guy could be a werewolf, a blizzard, addiction, a computer – what if a chat room took on a life of its own? Understand not only the victims, but also the perpetrators. Break stereotypes. Challenge yourselves so you can challenge your readers to break stereotypes. How can friends propel your story forward? Foils are human obstacles that stand in the way of your protagonist getting what he or she needs of wants…. What is their background, motivation, philosophy on war, drug use, college, future on this planet. If they’re hopeful, why? If not, why not? How will you tell this story to make it uniquely your own? Think visually. Unsusual formatting – including verse, journals, letters, etc. YA novels are often told 1st person, to put the reader solidly into the characters’ heads. Beware of didacticism and slang – date your book. Don’t stomp on your characters’ voices with your voice as a storyteller. What is the most impactful way to tell story. The adorable Richard Peck received the National Humanities Medal in 2002, the first Children’s book writer to receive the award. His remarks at SCBWI conference had us laughing and cheering. I’m thrilled to share his advice to writers of children’s books. Our opening lines – our minefield. Are we writing with invitation simplicity? As authors, we can doom ourselves with our own words. Adverbs destroy the rhythm of our speech. Boys don’t use adverbs. Why write with them? If you see an adverb, shoot it. In the lonely front of the classroom, I was handed another career – writing. When you’re a teacher you have no time for your own problems. As a writer, you have no time for yourself either because your characters are clamoring for attention. I learned how to talk in no other voice than the young character I’m writing about. Story is about the reader, not the writer. No one in this world wants to read your writing, except your own mother. Story is an alternative reality. Not what wasn’t but what should’ve been. Story must entertain above all else. The hook upon which all stories hang – universal truth that all actions have consequences. If actions have no consequences, the book falls apart. Consequences: Least attractive proposition for young readers. But if you can’t preach, add paranormal science fiction to grab their attention. Use anything to lure readers into our story. Live on our reader’s turf without invading it. Because of Mark Twain, the Mississippi River flows through all our stories. We never write about anyone who can walk away. We must go on the road to act out the book to our readers – to readers who don’t read reviews. Every book is a survival manual. We always throw our characters into the deep end. We turn up the heat! A book, like a school, should provide what is no longer available in life. A book should be a tighter community than in real life. Scenes strung together by an invisible wire…. Characters take on life based on luck – Characters become another human being on the page when we get outside ourselves. While the text message is always fiction, it is never literature. Social networking: A book unites, what the computer divides. Twice as many college graduates get degrees in social work than in literature or foreign language combined. Kristen Nelson of Nelson Literary Agency, Stephen Chutney of The Chutney Agency, Francis Plumpton of Richards Literary Agency, Sarah Davies of Greenhouse Literary Agency, Rosemary Stimola of Stimola Literary Studio, Marcia Wernick of Sheldon Fogleman Agency, Kendra Marcus of BookStop Literary Agency. Kristen Nelson – What grabs our attention? The turn of a phrase, character resonance…not action for action’s sake. Rosemary Stimola – Don’t wax nostalgic, that’s an adult thing. Kids don’t look back. 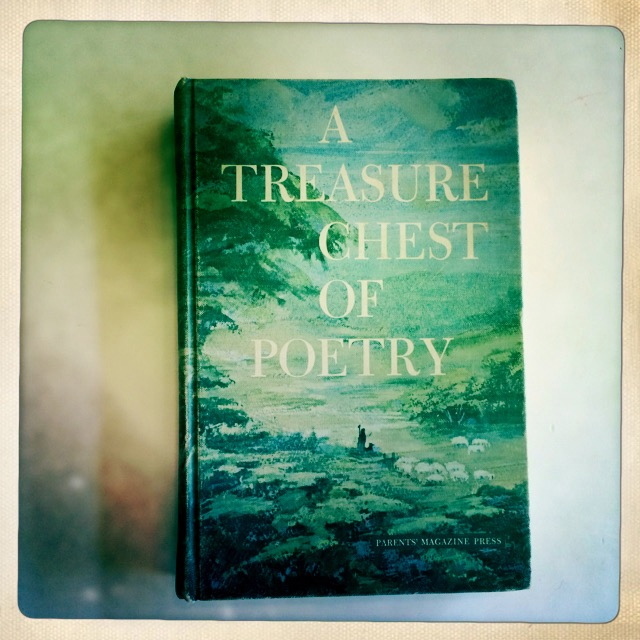 Sarah Davies – Titles sell books. Invoke an intriguing spirit of the story through the title. Kristen Nelson – Interested in simple writing. Need to write complex concepts with simple language. Marcia Wernick – Rhyme needs to work really well. Otherwise, no point. Need brilliant writing to pull off rhyme. Rosemary – Rhyme: what’s the driving force? Story should be in the driver’s seat. Rhyme shouldn’t drive the story. Sara – Don’t force words into the rhyming line to tell story. Kristen – Read your own words aloud. Smooth out dialogue. Stephen– A decent middle grade = 40-45k words. You can always tell a novel in fewer words. Marcia – First few lines need to draw reader in – grab reader, throttle them. Rosemary – If your character is starting summer vacation, start it! Rosemary – A times, language gets in the way of the story. I’m not against imagery, but my attention is pulled away from the story. Sarah – Agents see lots of overwriting, easy to overload a pieces with adverbs and adjectives. Keep it simple! Rosemary – Take care with “regionality” – words, descriptions unique to a certain place. May not be understood across areas. Rosemary – Spiraling: story moves forward then slips backward. Not good. Rosemary – Photographic novel in fiction (unless you’re the photographer) is harder to sell, but nonfiction might work. We’re looking for young, middle, YA. We work hard for good stories. Want stories that sound like a child and relates to children. Love non-fiction. Send me some! 3 agents: Sheldon, Linda Pratt, Marcia. Love to find new talent, but don’t take new clients. Mean-spirited stories don’t appeal to me. Character-driven story + voice compels and attracts me. Dystopian realm – Suzanne Collins of Hunger Games. Don’t follow trends but like setting them. Sarah + Julia Churchhill in UK. Business only 2 years old. Heartland: middle grade, tween, YA. Doing quite well with middle grade – beautifully voiced middle grade. Would love to find more Kate DiCamillo-type girl stories. YA – looking for fresh voice, different. Like whole gamet of stories. Great book = wonderful characters, great voice, great settings. Historical fiction – looking to fill hole in marketplace — Templar Trilogy, etc. What’s really selling now? Realistic contemporary fiction with characters and voices and situations that leap off the page. Fiction: YA + adult + middle grade. Glad to make NY Times list without blood and guts. Query letter – all electronic. 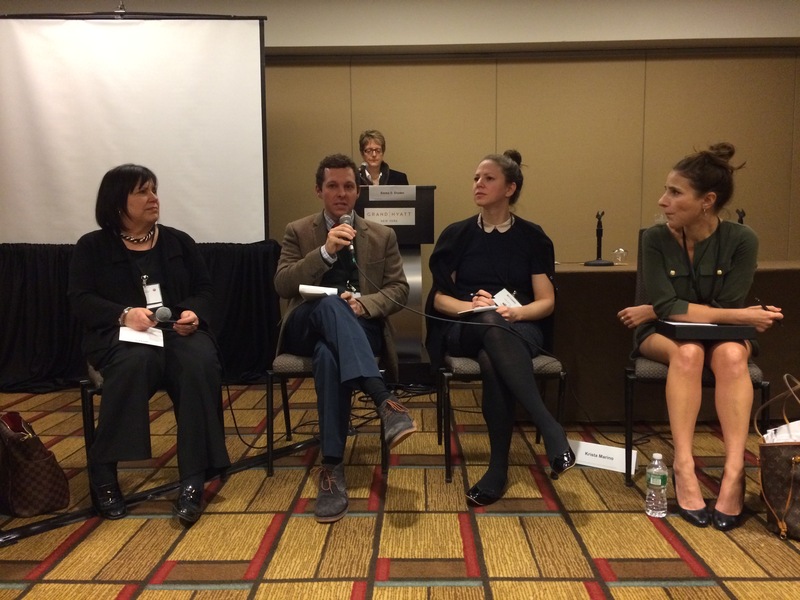 Kendra – publishing is a pendulum. It will swing back. Publishing Today: from Idea to Marketplace. Dierdre McDermott of UK WalkerBook Publishing, Stephen Roxburgh of Namelos US electronic publishing, Gita Wolf of Tara Books in India, Sara Grant of Working Partners UK, Tessa Strickland of Barefoot Books UK, Sarah Foster of WalkerBook in Australia & New Zealand, and Neal Porter of Roaring Brook Press. No longer tied to ink on paper. Hard cover and paperback – print only on demand. Electronic version – immediate download. Publishing for young people who don’t care about medium of delivery. Surface you read on shouldn’t determine what you read. Make books entirely by hand. Collective of writers and artists making books we want to see out in the marketplace. Use the strengths we have – people who paint walls and floors – and nudge tradition along to a more contemporary field. “Do” – award-winning book – 2010 BolognaRagazzi award. Brings back the craft of bookmaking. Work with Sarah Davies Greenhouse literary agency. Work out story line to fill gaps. Look for writers to write the samples from storywriters based on sample outline. Sample chapters shopped around to publisher. New story coming out: David Beckham meets James Bond. Started as small independent house, now owned by McMillian. Took five years to bring into being. Where language is image other than words. 12-16 new projects per year. Young fiction program – bringing into the English language wonderful stories that haven’t made their way into English. “The Gift” – Carol Ann Duffy and Rob Ryan Peters. Looking for books that will stay around for sometime. Walker Books in Australia & New Zealand. “Pearl Verses: The World,” by Sally Murphy Illustrators by Heather Potter. Picturebook making is very slow. Question: Digital revolution – is this hopeful news? How is the revolution affecting your editorial/publishing process? Sarah Foster – We make it up as we go. Agents don’t think through what they’re asking editors for. Stephen Roxburgh – Publishers don’t know what to do with e-books. They don’t know how to re-gear. Business model has to be dealt with. In the meantime, books are being withheld. Model – it’s a partnership. We split 50-50. But we don’t know what we’re splitting. It may be 50% of nothing. Dierdre – A good story is good story. No matter the medium. Question: Is the picture book is the last book standing? Tessa – Books not going away. Just like TV didn’t do away with books. Making our books available e-books. YouTube videos from picture books. Internet plays an absolutely central role in what we do. Gita – Marketing question. We use internet/youtube We have oral storytellers. We put the bards (who sing) on YouTube. Book is the intermediate step. Neal Potter – Penguin did iPad models of books. Spot: DK Guide to Rome (GPS map). Vampire Academy series. Changed my feelings about digital books. GPS applications of DK is revolutionary app. Allows us to go beyond the 32 page format. 32-page format is a great economical model – works to constrain authors/editors. Question: Print on Demand model. Do authors and illustrators still need publishers? Tessa – Illustrators enjoy online media. Blogging is a great medium for writers. Marketing directions really exciting. Stephen – Traditional publishers brought set of capabilities to the table. Access to distribution from publishers. Traditional set of functions on the table will change. Publishers need to give authors what we need. Neal – Editorial process. It’s what we do. It depends on how authors value what we do. As publishers have gone more corporate. Editorial process diminishing with how fast market process moving. Sara Grant – Glad I never took to market some of my apprentice novels – aka – garbage. Stephen – Brilliant editors let go. You can find editorial help outside the publishing houses. Question: How is this changing editorial process? Sara Grant – New generation of editors – proactive about the type of fiction they want to create. Tessa – 25% new authors. Dierdre – 2 new – finding new picture book writing hard. Sara – 1 new writer – great training writers to work with editors. Question: How do you find voices? Gita – We travel a lot to find best artists, community art. We find only one or two people each place who are willing to work in a new art form or format. Question: Global market – which countries are the fastest growing? Gita – Is India really as hot a market as hype would have it? Not convinced. Neal – Americans are great navel gazers. We’ve avoided selling our books across the world. Americans are more culturally insular. To turn it around, I come here to Bologna to see what I don’t see in U.S. – new and fresh. Dierdre – If your book can make it to America, you can make it everywhere. Millions of people with money to spend. Good books will go anywhere. Sara – Find an agent with an international base. Stephen – Distribution. In cyberspace, everything is around the corner. Not today, but talk to me tomorrow. Question: How important the BUZZ is to make the book survive? Neal – Issue of maintaining or starting the buzz. Authors must take proactive role in selling book. Editors and marketers cut from budgets. What money is left is concentrated on big names. Blogging, networking, facebooking helps authors. How do you separate the quality sounds from the rest of the noise? The cab driver stopped at the curb and pointed across the street. Penn Station. Our destination. I stepped from the cab. Frigid 16-degree air bit the flesh on my face, as if ravenous hunger drove its aggression. Sharp. Painful. I thought about Steph’s poor ungloved hand. Somewhere on the streets of New York City lay one turquoise glove. We gathered our luggage and dodged oncoming traffic to cross the street. “I have no idea. I’ve never been dropped off here before.” I looked up to see the Madison Square Garden sign overhead. Somewhere inside this structure, our Amtrak train awaited. I lead my daughter into the building. The moment we stepped beyond the entry, we encountered creatures — humanlike, yet not quite alive. None made eye-contact. Some spat unrecognizable words. They shuffled in slow forward motion, as if on auto-pilot. Male and female, tall and short, dirty and ragged. Everywhere, yet nowhere. I felt as if we’d entered Zombieland, formerly known as Penn Station. “Are they allowed to live here?” Steph spoke softly, fearing one of the creatures might awake to our presence. “I don’t know. Maybe if they keep moving. It’s too cold out there to survive for long.” We kept moving too, quickening our pace. Steph saw the ticketed passenger lounge area before I did. Humans greeted us. Real, live humans. They stood apart from the zombies — making eye-contact, speaking words we understood, and yes, they smiled. We flashed our tickets and slipped into the safety zone where zombies weren’t allowed. Guilt followed us in. I’ve been back from the Society of Children’s Book Writers and Illustrators Winter Conference in New York City for several days now. The images from Penn Station still haunt me. I’m overwhelmed by what I saw. I looked up statistics for New York City: 38,000 individuals EACH night use shelters. That number obviously misses all the homeless we saw in Penn Station at 6:00 in the morning. The NYC Department of Homeless Services offers help for those in need, but the problem just seems SO huge. Sometimes I fixate on issues that I think are problems — like my heater can’t seem to get over 64 degrees in this crazy cold weather. But hey, I have a home to shelter me. I may get frustrated when project I’m working on doesn’t go forward as quickly as I’d like. But, I have a job and a paycheck coming every two weeks. How easy to let all the little things in life bug us. In the grand scheme of life, who really cares if I don’t make it through the traffic light behind the car in front of me? My trip to Zombieland reminded me: be thankful, count my blessings, help those who can’t help themselves. Be the giraffe: Don’t jump to the obvious. Dig deeper for the unexpected. Find the cracks. Let the light in: Allow the characters be fully human. Let them have flaws. Allow them to make mistakes – not placing them in harm’s way, but for on the path of painful truth. Stay away from trends: Danger, Will Robinson. Danger! Don’t stray to far from your story where you can’t hear your characters whisper. No sure thing exists, in the world of writing, except what is deep down in your heart. Make it as true as you possibly can, then dig deeper. First you jump off the cliff, then you build your wings: Take the fear in. Welcome it. It’s your compass. Go ahead. Jump. Experience the terror of the fall. Trust in your work, and wait for the wind to help you soar. Alvina spoke about Literary Novels. She shared the distinction between commercial and literary. Literary fiction: characters focus, description, beauty of the language. As a literary editor, Alvin is looking for books to fall in love with, savor every word. Literary fiction steeps in relationships, characters, development of internal struggle. Literary fiction is quieter than the commercial fiction; more about the writing, less about the plot. Both should be well-written. Literary books may not sell well, but hopefully get a good review. Ben shared insights on the teen fiction market. Don’t “windmill-write” — too much info to set the stage, where words are thrown to the wind. All stories have been told before. Tell them in new ways. Teen readers need the cafeteria connection — real life issues. Combination of voice and concept important. If you behave badly with your writers group, they won’t give you good feedback. If you behave badly with your agent, He/she may not pitch to editor. If you behave badly with your editor, he/she may not not push book forward to publication. And so on…. 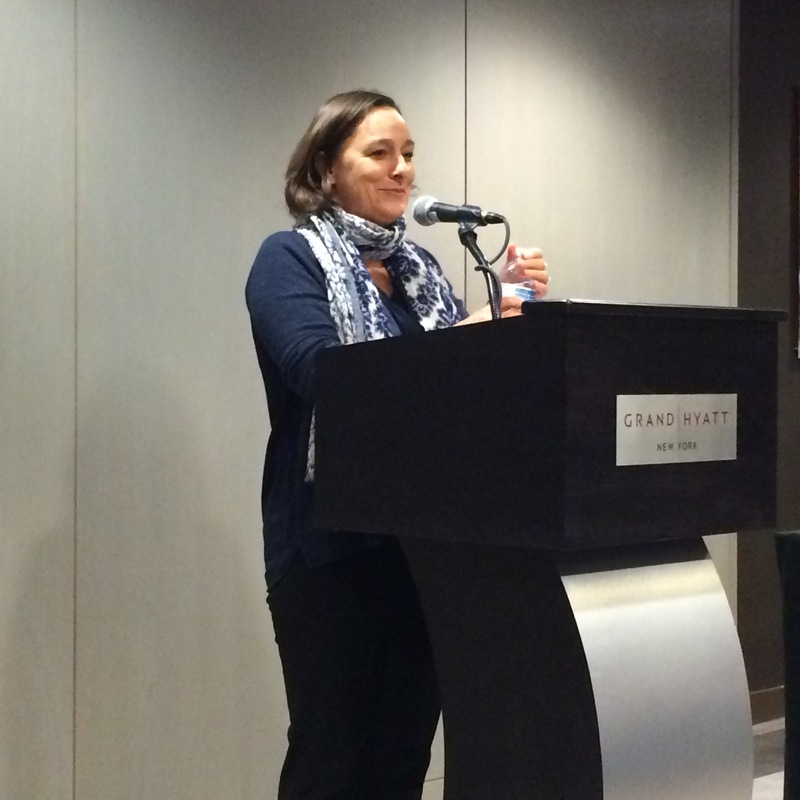 Arianne shared insights on the YA fantasy market. Baseline: quality writing, plot line, character development. World-building: Craft fantasy world focused on people and stories. Story must stay personal to the main character. Concept: idea must be workable, fit into a logical structure. Characters can’t suddenly discover new powers to solve problems in the plot. Rules: Scope out all the rules of the fantasy world. Understand them and how the characters would interact in this new world. Good story-tellers unfold the world without exposition. Find an organic way to introduce information. Start at a pivotal moment in the story, but decide what is the pivotal moment for your character. Common mistake of new writers: too aggressive with fantasy elements. They cram everything into the story. The dragon saving an elf in vampire land won’t ever work. Whew! Another big day. Mary Poppins on Broadway awaits. Tootles. NASA Space Operations Outreach Manager. My job: Inspire others with the drama & magic of space. My advice: Turn off the TV. Watch the heavens unfold.